We’re coming up on mid January, early conference play for college basketball. While the men’s basketball team has multiple questions to this point, one is clear: Louisville is better with Ryan McMahon on the floor. Because of this, McMahon needs to start over VJ King. Just because a player starts, doesn’t mean their playing time needs to be cut or bumped up a large amount. It simply means one player should begin the game on the court. To this point, what has Louisville’s strength included? Scoring ability. Their weakness? Let’s pick one and say decision making. King has not made the best decisions, on either side of the court, all year. He is in his first year playing big minutes, it’s not usual. McMahon, on the other hand, is the exact opposite. The crafty, under-sized guard has great knowledge of the game and makes quality decisions on both sides of the court. King: The five-star former McDonald’s All-American. A 6-foot-6 forward, King is known for his scoring and athletic ability. Wanted by many, landed by one. McMahon: The barely recruited, 6-foot guard considered a one-diminisional player. The shooter was wanted by few, landed by one. King is a quality player that still needs to get a lot of playing time. His talent is undeniable and needs to see the court. But for this team, right now, King shouldn’t start. McMahon is a smart player who not only finds himself in the right place at the right time, he finds his teammates. King has a tendency to dominate the ball or hunt his shot, stalling and even sometimes killing the movement of the offense. McMahon rarely forces a shot and often looks for his teammates first, allowing more of a flow offensively. Louisville has been close in nearly every game this season. One or two bad decisions offensively and/or defensively can make a huge swing in a game. King, while he has made his fair share of plays in big moments this season, has made too many negative plays that limit the team. Defense is where King tends to hurt the Cardinals the most. The sophomore is often late on rotations in zone, which leads to King fouling his man or putting his teammates in bad positions. In man-to-man, King gets beat off the dribble, which leads to similar results. McMahon, while he’s much less athletic and lacks the size, makes the smart plays. The guard only has seven turnovers through 17 games. For a team like U of L, who has three of their four losses by single digits, they need every quality possession they can get. While they both have their up and down side, McMahon provides the team more upside at this moment. This point was proven in the Florida State game. While McMahon was on the floor, the ball was moving offensively and the guard knocked down a huge 3-pointer that put U of L within five points. King checked in shortly after. While down four — with seven minutes to play — King jacked up a deep, contested three once the shot clock hit 10. Instead of attempting to drive the lane or passing to a teammate, King forced a bad shot in a critical moment. King was taken out right after, replaced by McMahon. Louisville gained their first lead of the game on the 3-pointer from McMahon with under 4:54 to play. Soon after, McMahon ran the offense to perfection and found Anas Mahmoud for the dunk, putting Louisville ahead by five with 2:52 remaining. And who was the player that stepped to the line with two seconds to play with a two-point lead? McMahon, who sunk both. In the 94-86 win over Virginia Tech, McMahon sunk two big-time 3-pointers at different times. With Louisville ahead by five with under three minutes to play, McMahon didn’t hesitate to pull the deep three and bury the Hokies. 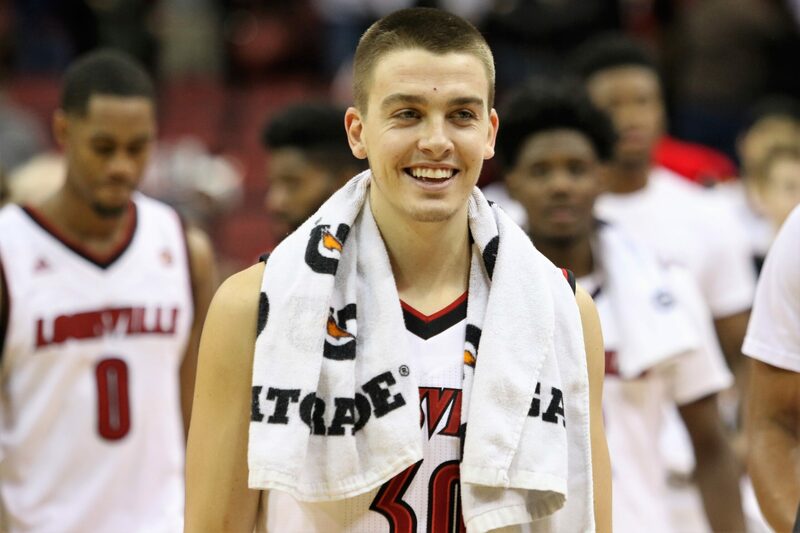 “Ryan McMahon, it’s like he lives for those moments,” acting head coach David Padgett said. Even his teammates know the type of edge he brings to the table. “(McMahon is crazy for taking those type of (deep) shot. When he makes them, like we all know he can, it’s a game changer for us,” senior Anas Mahmoud said. In back-to-back games, McMahon has put away the two Louisville opponents — something he prides himself in. “I love (those moments). That’s what you spend all those hours extra in the gym for,” McMahon said. Against VT, King scored 16 points and started the game shooting 5-of-6. He finished 5-of-9 with three turnovers, failing to come through during the last stretch of the game offensively. Louisville is simply better when McMahon is on the court over King due to decision-making ability. King should still get playing time, but McMahon needs to start. Additionally, no one should give up on King. He has way too much talent to disregard and will likely play a huge role in the team’s success if they’re to have some down the stretch. But for the time being, McMahon needs to have his name heard when teams are announcing their starting lineups. You can follow Dalton Ray on Twitter @dray577.